While we spend much of our time with Eloqua customers supporting them with their campaigns, we also use Eloqua to drive our own marketing efforts. I thought I’d share some of the activities I’ve been up to over the December & January period as we get ready for another year. The key thing to set in place was the “Contact Us” forms and the auto-responders. Our normal SLA for enquires is the same day. However, with the office closed, we had to make sure the contact us form and the associated communications were setting the right expectations. Our Contact Us form is an Eloqua Landing Page and form, with an Eloqua Landing Page serving as the confirmation page. The person submitting the form is also sent an email confirmation of their submission. There was no need to dramatically change the content of the pages, just some slight copy changes which could be changed in January. However, it was easier to create a Christmas/New Year email advising that we’d get back to them once the office reopened. You can see below how we used the Eloqua Form Processing Steps to deliver the right experience. You can see the two highlighted processing steps “Send Submitter an Email”. Now that we’re back at the office, we’ve simply turned the Christmas/New Year email off by selected the “Never” option. Eloqua has a function called Shared Content. It’s powerful, but from my experience, an underutilised feature. Shared content is reusable content snippets that you can create once, then reuse in emails and landing pages. It allows you to “build once, reuse everywhere” for your most valuable common pieces of content. You increase your efficiency by writing content once and reusing it. You ensure consistency of your marketing collateral and enforce standards in the production of your marketing assets. You can include text, images, hyperlinks and field merges in shared content. 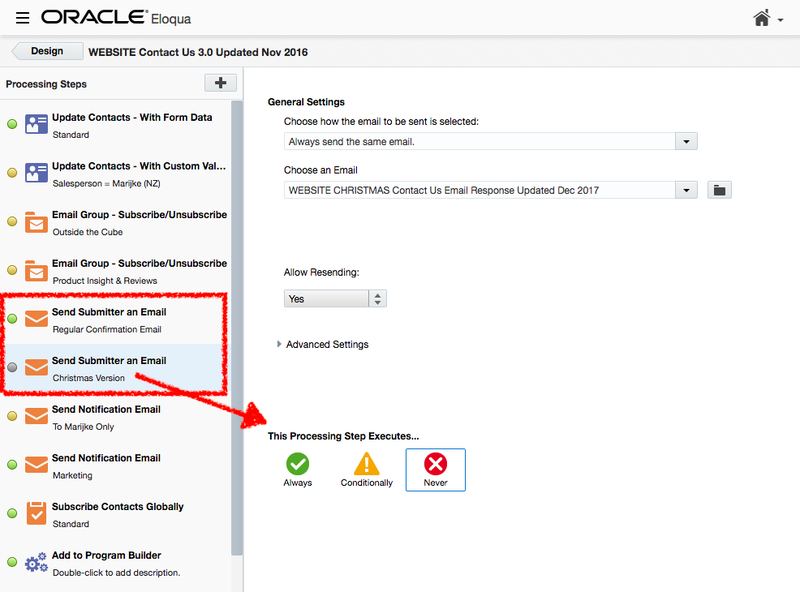 In the context of this blog post, any calls to action you have across your Eloqua Landing Pages or Emails can easily be updated all at once, using Shared Content. Shared Content is added to an asset like you’d add an image or copy. It functions like Dynamic Content but is constant whereas Dynamic Content changes based on the profile of contact/person viewing the Dynamic Content. When was the last time you looked at every page of the website? Ok, I have to be honest here. I messed up and removed some CSS which made all of the banners on the website black – whoops. If the developers weren’t on leave, I could have asked them to help me, but I didn’t want to bother them. So, I spent two days going through all 63 pages of the website, which while painful, was actually a good use of my time. I found some copy that needed updating, changed and new images used. We had some old screenshots of Eloqua that needed updating. While this was not on my agenda, it was a very useful exercise and I now have some action items for new content.